Affordable kitchen and bath remodels begin with good planning, patience and persistence of vision. Measure your space carefully; remember clearances required for baseboard trim, back splashes, windows, doors and plumbing placement (here’s where a plumbing professional can make a difference in your planning phase – you don’t want to buy something that won’t fit or will need major re-plumbing you hadn’t budgeted). When considering new cabinets and fixtures, remember to note finishes and how they will fit in with the parts of the room that cannot or will not be changed. If you have specific color schemes in mind, try to carry swatches with you, along with the measurements. You want to be prepared to act when a bargain presents itself. This is key to saving: be on the lookout for specials on craigslist, at appliance and supply stores, or closeout notices. It helps to know what you want; even better if you can be flexible. Always check the sale areas for custom pieces were refused, perhaps due to an error in measurement or color code. We snagged a $1000.00 two-lavatory custom countertop in an unusual size (the one we needed!) for $300.00. A closeout cabinet in the color and style we wanted was reduced from $750.00 to $350.00. We’d been thinking about a bathroom remodel since we moved into our home 7 years ago, and it all came together within a couple of weeks. If you work with a trusted plumber, clue him in on your plans, as he has access to trades-only suppliers, where high-end fixtures (floor samples, “changed-their-mind” special orders) can sometimes be found for less than half their retail cost. Of course, it is the proper courtesy to engage that plumber to install the fixtures he may help you procure. Bargains abound. 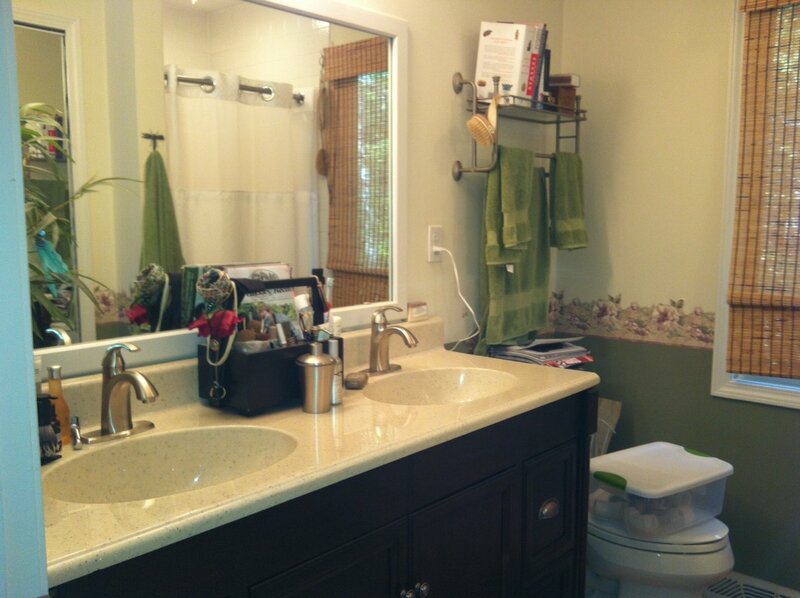 Affordable fixtures are available in attractive styles and finishes. What you save on hardware you can invest in professional installation, and still come out ahead. Happy remodeling!